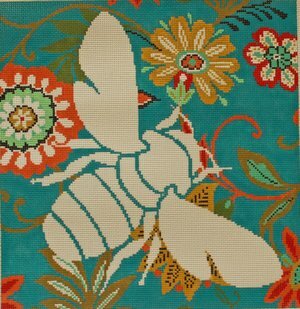 The Silhouette Bee hand-painted needlepoint design is by The Meredith Collection. It features a bees surrounded by bright flower. The design area measures 12" x 12" and is hand painted onto 13 mesh needlepoint canvas. Sold canvas-only or with fibers. If you select cotton fibers we will send you DMC cotton floss; if you select wool or silk we will send Planet Earth boutique fibers which are single ply for 13 mesh and very easy to stitch with. If you require stretcher bars we recommend two sets of 16" and some thumb tacks. This design is usually in stock and ready to ship straight away. If you're in a hurry, or want to know in advance when it can be sent, then please contact us. We are always glad to help. Contact us with questions about this needlepoint design.